The Straight Arrows Trail offers 35 miles of OHM single-track riding and an additional 18 miles of multi-use trails. The trail mixes straight stretches with tight curves and steep hills to challenge even the most experienced riders. Located along the Wisconsin border, the trail connects to an additional five miles of riding in Wisconsin's Douglas County Forest. The Nemadji State Forest is classified as LIMITED. 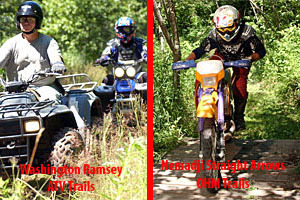 The Straight Arrows Trail is maintained by Pine County and the Straight Arrows Enduro Riders Motorcycle Club. Parking and trail access is located east of Nickerson, in the Nemadji State Forest off Harlis Rd.